The meeting was opened at 8:30 by Commissioners Borner. Commissioner Berry and Carlson were present. Commissioner Carlson made the motion to approve the amended January 14, 2019 minutes. Commissioner Berry seconded the motion. (Commissioner Berry was present only for the 3:00 business portion of the meeting) Motion carried. Commissioner Carlson attended the Safety Meeting. They are going to concentrate on speeding up Workers Comp. reviews, processes and investigations. They will be looking into making sure anyone driving a county owned vehicle has a valid driver’s license. Volunteer Fire Departments rosters need to be updated. Commissioner Borner attended a meeting with the Roundup Community Partners regarding a Community Builders Grant. The City and County can apply for the grant together and it is specifically for coal impacted and low income communities and it is for land use and a study plan. County owned property not in the FEMA mitigation. Commissioner Borner suggested tearing down the structure on a piece of County owned property while they have the equipment for the FEMA demo. Commissioner Berry and Carlson agreed. Central Common’s maintenance issues. Getting quotes. Wells Fargo Building. Commissioner Berry is going to go directly to Wells Fargo to talk to them. Bids for Extension Office. Commissioner Carlson said it should be ready soon. Storage in Courtroom. They have gotten some responses but want to talk to Judge Spaulding for his input. Steps at the Courthouse. Commissioner Borner talked to Fred Winkler and he will check on what all needs done after the snow is gone. Damaged wiring on Courthouse. Sent the bid to insurance. Maintenance- Lorie Jett. Did not attend the meeting. Road and Bridge Supervisor Stockert and Secretary Kenner gave their weekly report to the Commissioners. Commissioner Borner signed some zoning compliance forms for a gravel pit reclamation extension. For the #4 Rd. alteration the board will do an agreement to the Jensens that if the County cleans up the title they will have an easement through the property. Mr. Jensen agreed to granting and emergency route if needed sooner. Mr. Pedrazzi said they would like to discuss it further and will be available next week. Sheriff Lesnik gave his weekly report to the Commissioners. The “Active Shooter” training at the schools Monday went well. They are installing a new operating system. Mr. Lesnik will check to see if the County is able to do a valid license check for volunteers that drive County owned vehicles. Accounting Supervisor Angel gave her weekly report to the Commissioners. Ms. Angel told the Commissioners that the County may have to look for a new I.T. person soon. 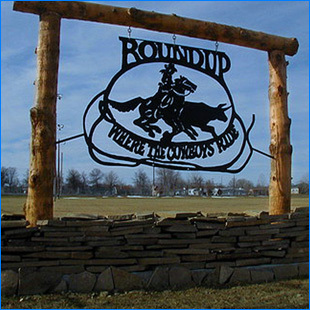 Commissioner Borner said that she is willing to work with the Roundup Schools to keep their partnership open for I.T. Director of Technology Toombs has been a valuable asset for the County. DES Coordinator Fisher gave his weekly report to the Commissioners. We have received 4 reply’s accepting the County’s offer on FEMA properties. 2 more appraisals came in this morning for other FEMA properties. 11:15 Public Hearing on an Ordinance for Fees to go with the Burn Permits. Ambulance Director Solberg did not attend the meeting due to an injury. Weed Coordinator Beck met with the Commissioners to give them an update on her new building. The start date will be determined by the weather. Ms. Beck was able to get cabinets, lighting and heating and air from the Carson property. Airport Manager Kelly Gebhardt and Ron MacAdon met with the Commissioners. They are going for a grant with the FAA for pavement rehabilitation and there are some forms that need signed. The Commissioners agreed to have electric ran to all hangers at the airport. County Tax Deed Auction for property in Section 33 of Township 11 North, Range 31 East in Musselshell County. No public attended. Greg Benjamin from Stahly Engineering called the Commissioners regarding structural issues at the Musselshell County Central Commons. Mr. Benjamin will be here on Monday January 28, 2019 to do a site visit and meet with the Commissioners. Cody Samuelson from Key Insurance met with the Commissioners to go over Insurance renewals for the County buildings. Mr. Samuelson told the Commissioners that the numbers are based on 2012 appraisal values and they can be increased. The Commissioners will go over the spreadsheet and update it before the official renewal meeting. There was no public comment for the business meeting. Item #1 to review the Renewal Application for 2019-2020 submitted by Montana Association of Counties and Item #2 to review the 2019-2020 PCT Renewal Scheduled Acknowledgement Form Submitted by MACo were tabled by Commissioner Carlson for more time to review. Commissioner Berry seconded. Carried. Item #3 to discuss and vote on hiring an Engineering firm for Central Common’s structural issues tabled by Commissioner Berry until they get another quote. Commissioner Carlson seconded. Carried. Item #6 to Approve and sign the Ordinance for Fees to go with the Burning Permits was tabled by Commissioner Carlson until next week. Commissioner Berry seconded. Carried. Commissioner Carlson made the motion to approve and sign Certificate of Survey 2019-1RB Amending the Plat of Newton’s First Addition of Roundup, Lots 1, 2, 3 & 4 submitted by Michael B. & Elaine A. Krueger. Commissioner Berry seconded the motion. Motion carried. Commissioner Berry made the motion to approve and sign Resolution 2019-9 Amending Resolution 2018-26 Determining Fair Market Value and Order for Sale of County Owned Property. Commissioner Carlson seconded the motion. Motion carried. Commissioner Berry made the motion to approve and sign the Official Offer for Bruce Archer based off the appraisal done by Barta Appraisal in the amount of $175,000.00. Commissioner Carlson seconded the motion. Motion carried. Commissioner Berry made the motion to suspend the rules to add 3 more items to the agenda. Commissioner Carlson seconded the motion. Motion carried. Commissioner Carlson made the motion to approve and sign the Official Offer for the Glancy Family Trust based off the appraisal done by Barta Appraisal in the amount of $16,000.00. Commissioner Berry seconded the motion. Motion carried. Commissioner Berry made the motion to approve and sign the Official Offer for John S. Ries based off the appraisal done by Barta Appraisal in the amount of $9,000.00. Commissioner Carlson seconded the motion. Motion carried.